The bilberry has extremely high nutritional value, and they are said to be nature’s own vitamin, mineral and polyphenol pills. The bilberry contains little energy and no saturated fat, thus making it good for low-fat diets. Bilberries also contain vitamin E and are a source of fibre. The bilberry contains several times more flavonoids and anthocyanins than the cultivated highbush blueberry. The regular consumption of berries has been observed to have a positive effect on contributing factors of cardiac health, blood coagulation, blood pressure and HDL cholesterol. In studies, polyphenols have also been observed to prevent viral and bacterial attachment and growth, and slow cell aging. For this reason, berries are also studied in the prevention of various inflammatory disorders. Kaskein refines multiple products out of Arctic bilberries but also supplies them for the use of food and pharma industries all over the world. The Arctic bilberry (also known as wild blueberry) is found in the clean northern forests. The bilberry is a perennial shrub that reaches 10–30 cm in height, with green stems growing out at an angle. In southern Finland, the bilberry usually ripens in mid-July, while in northern Finland it ripens in late July and early August. Early summer weather conditions can affect the ripening time. The berry is spherical with a diameter of 6–8 mm. It is either dark blue and waxy or black and shiny, with dark blue on the inside. 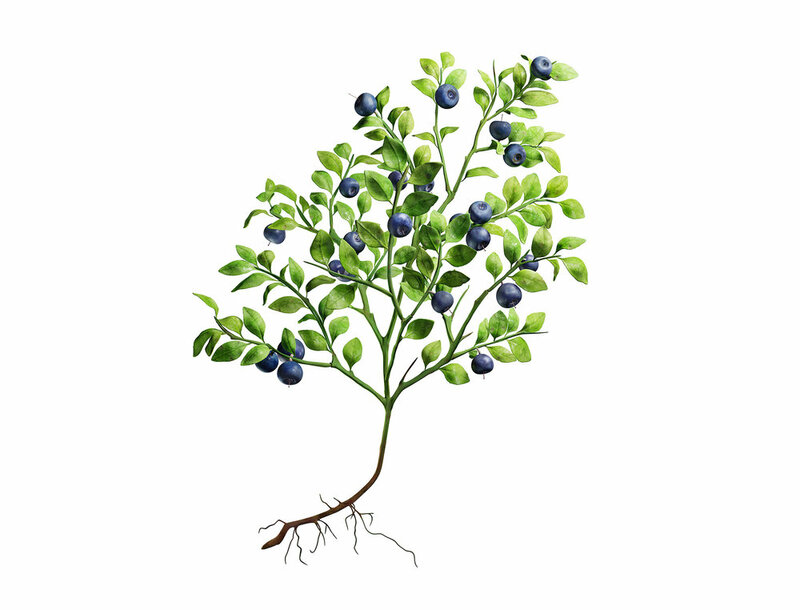 Unlike the cultivated highbush blueberry, the Arctic bilberry is blue both inside and out. Seasonal change and long, light-filled summer nights provide favourable growing conditions for the bilberry. In summer the abundance of light, ample warmth and a suitable amount of moisture ripen the wild Arctic bilberries. It usually takes 8–10 weeks for a bilberry to develop from a flower into a ripe berry. In mid-summer, there are 19 hours of daylight in southern Finland, and in the northern Arctic Circle region the sun does not set at all. According to studies, this remarkable amount of light promotes the formation of anthocyanin compounds. Due to Finland’s northern location, wild Arctic bilberries form extremely high levels of anthocyanin and polyphenol. Kaskein’s organic bilberries are picked from organic certified forests in northern Finland. The easiest way to enjoy the benefits of this Arctic superfood is to have a shot of Kaskein’s 100% bilberry juice daily. Lingonberries have been used for centuries both as food and as medicine. Also known as foxberries or cowberries, these tangy red berries can be eaten raw or processed into delicious lingonberry jam. Freeze-dried lingonberries contain most of the nutrients of the fresh berry and look almost as beautiful too. Lingonberry is nature’s own vitamin, mineral and polyphenol pill. It is virtually fat-free and does not contain any saturated fat. This is why it is excellent for those who are in need of watching their weight. Lingonberries are also a source of dietary fibre and vitamin E. When it comes to minerals and micronutrients, lingonberries have virtually no harmful sodium, but are rather abundant in potassium. Arctic lingonberries are rich in polyphenols, for example, resveratrol, quercetin and proanthocyanidins. They are also rich in organic acids, such as benzoic acid, which play an important role as natural preservatives. The nutrients in lingonberries have also been linked to a lower risk of infections such as urinary tract infection. The lingonberry plant has stems between 5 and 30 centimetres long. The leaves are pointed and green with a light green underside. Unlike some plants that lose leaves in the autumn, the lingonberry plant keeps its glaucous leaves and they even survive the winter. The berries are round, red and juicy with a slightly acidic taste. The berries are ready to be picked between the end of August and the beginning of October. Lingonberries grow all throughout Finland. Kaskein’s organic lingonberries are picked from organic certified forests in northern Finland. We make healthy and delicious lingonberry products, and also supply berries and processed ingredients to the food industry around the world. Cranberry is a good source of vitamin C and fibre. Its bitter taste is due to the presence of various natural acids: malic, citric and benzoic acid. Polyphenol compounds typical to the cranberry are flavonols such as quercetin and myricetin. Cranberries also contain other polyphenols such as lignans and proanthocyanidins. The nutrients in cranberries have been linked to a lower risk of urinary tract infections and improved immune function. Cranberries contain benzoic acid, which preserves the berries naturally, making them great for cooking and baking. Cranberries are used in berry soups, porridges, casseroles and baked goods. Autumn cranberries are rich in pectin, which is a natural gelling agent and makes them an excellent ingredient for marmalade and jam. The common cranberry (Vaccinium oxycoccos) is a prostrate, low-growing shrub reaching 10–80 cm in length. Its overwintering leaves are 6–15 mm long, elliptic or tapering, glossy and green above and whitish underneath. The pink flowers of the shrub grow in pairs or groups at the ends of its branches. The cranberry flowers in June–July. The berry is round, 10–15 mm in diameter or teardrop-shaped and widening either at the tip or base. The berry is red or a deep bluish red and acidic to the taste. Cranberry grows in all parts of Finland with the exception of the northernmost reaches of Lapland. It grows in nutrient-poor, sunlit fens and pine bogs. The habitat of the cranberry has diminished in recent years due to peat extraction and the draining of bogs. Cranberries can be picked from the end of September until the first snow and from under the snow in spring, when their sugar content has risen and they are less acidic. Kaskein buys cranberries not only from Finland, but also from such countries as Russia and Estonia. This is because our domestic supply isn’t enough to meet the demand. We always inspect all of the cranberries we buy, and only purchase them from known partners with whom we’ve worked with for years, auditing them regularly. Try our 100% cranberry juice and sweetened cranberry juice! The sea buckthorn is definitely worthy of the title of “superberry” as it has the highest nutrient content of all the wild berries. It is rich in vitamins C and E, fibre and essential fatty acids. Wild sea buckthorn grows in the Finnish coastal regions of the Gulf of Bothnia and the Åland Islands, flourishing best on pebbly, sandy or shingly beaches. Its thorny shrub grows 0.5–3 metres tall. The leaves are 1–5 cm in length and linear, greenish-grey above and silvery-grey to rusty-brown underneath. The sea buckthorn flowers in May before its leaves appear. The flowers are very small and yellowish-green. The berry is an elongated, yellow or yellowish-orange juicy drupe 8–10 mm long. They can be picked from the beginning in October, but the best time to pick them is after the first frost. Sea buckthorn is used in the food industry to make sauces, jams, berry powders and juices. Sea buckthorn oil is used in the preparation of dietary supplements, cosmetics and for treating atopic skin. The berries can be enjoyed on their own or in, for example, porridges, yoghurts and smoothies. They can be preserved by drying or freezing or in the form of juice or jam. Kaskein buys sea buckthorn from Finland as well as from abroad. Our sea buckthorn juice is made out of berries that come from our trusted organic cultivator partners in Western Europe. We audit our suppliers frequently. This way we maintain high quality and flawless traceability in our products and partnerships. We at Kaskein use this amazing berry to produce juice, jam and jelly. We also sell sea buckthorn and refine its nutritious and healthy ingredients for the food industry. Blackcurrant is a native berry to Finland, originally growing on wet land and later adapting to varying conditions. Blackcurrant berries contain more than 300% of the daily recommended value of vitamin C in a 100-gram serving. This vitamin has antioxidant properties that can stop free radicals (via exposure to toxic chemicals and pollutants) from damaging cells and contributing to aging, cancer, heart disease, and inflammation. B-vitamins in blackcurrants – such as pantothenic acid (vitamin B5), pyridoxine (vitamin B6) and thiamin (vitamin B1) – are called "essential" because they are needed by the human body for metabolism. Clusters of greenish-yellow blackcurrant flowers bloom in the spring. Flowers give way to long, pendant clusters of berries that ripen in June-July. The lobed, medium green leaves are aromatic when crushed. The berries can be eaten ripe off the shrub and used to make juices, jams and jellies. Kaskein buys blackcurrant from home gardeners as well as from professional cultivators. We are constantly looking for new suppliers for both organic and regular blackcurrant. Get to know this healthy, delicious berry by trying out our blackcurrant juices, jam and jelly. Raspberries contain vitamin C and folate. The amount of vitamin C in 100 grams of raspberries is equivalent to that of an average-sized tangerine. It is also a good source of fibre. As is typical for aggregate drupes, raspberries contain the class of polyphenols known as ellagitannins. The raspberry plant is a shrub that reaches 50–150 cm in height. Its stems are biennial and prickly, erect or arching. In the summer of the first growth year, the stem is green and unbranched. By the next summer, it is woody and branched. This is when the flowers bloom and the berries ripen. The upper surface of the leaf is green and the underside densely hairy and either white or grey. The shrub loses its leaves in the winter. Its greenish-white flowers bloom in June–July. The berry is a sweet and fragrant red aggregate drupe, with a zesty and delicious flaovour. The raspberry is commonly found in southern and central Finland, reaching as far north the southern part of Lapland. It grows in herb-rich boreal forests and along the margins of ditches and forests, the banks of streams and rivers, and the edges of logging areas and roads. It spreads quickly in nutrient-rich forest regeneration areas and can keep growing in these areas for 20–30 years. The Finnish raspberry season runs from the beginning of August until the beginning of September. The berries ripen and the flowers bloom best in sunny conditions, such as those found in young forests and logging areas. Good crops are also produced along forest roads and areas cleared for power lines. Raspberries are used in juices, berry soups, baked goods and desserts. The delicious berry is lovely on its own or as part of a snack or any meal. Raspberries combine well with other berries, too: for example, they can be mixed with bilberries to make queen’s jam, a Nordic specialty. Raspberry can be preserved frozen, dried, or as juice or jam. Kaskein buys raspberry from dozens of Finnish cultivators. We are constantly looking for new supplies. During the harvest season we sell fresh raspberries to bakeries, confectinaries, hospitals, daycare centers and to the Finnish food industry. Try out our freeze-dried raspberries. Strawberries are an excellent source of vitamin C and manganese, and also contain decent amounts of folate (B9) and potassium. The berries are very rich in antioxidants and plant compounds, and may have benefits for heart health and blood sugar control. Pelargonidin is the major anthocyanin in strawberries, and causes the berry’s bright red color. Anthocyanins may have benefits for heart health. There have also been studies about the effects of freeze-dried strawberry supplements on type 2 diabetes or metabolic syndrome. Strawberry is low-growing herbaceous plant with a fibrous root system and a crown from which basal leaves arise. The leaves are compound, typically with three leaflets, sawtooth-edged, and usually hairy. The flowers, generally white, appear in small clusters on slender stalks. Botanically, the strawberry fruit is considered an “accessory fruit” and is in fact not a true berry. Strawberries are bright red in color, have a juicy texture, a characteristic aroma, and a sweet flavor. The flesh consists of the greatly enlarged flower receptacle and is embedded with the many true fruits, or achenes, which are popularly called seeds. They are native to the temperate regions of the Northern Hemisphere, and cultivated varieties are widely grown throughout the world. Kaskein buys strawberry from dozens of Finnish cultivators. We are constantly looking for new supplies. During the harvest season we sell fresh strawberries to bakeries, confectinaries, hospitals, daycare centers and to the Finnish food industry. Strawberries are often consumed fresh, but can also be used in a variety of jams, jellies, desserts and for food flavoring. Try our freeze-dried strawberries – they capture the flavour of the Arctic summer to be enjoyed all year round.